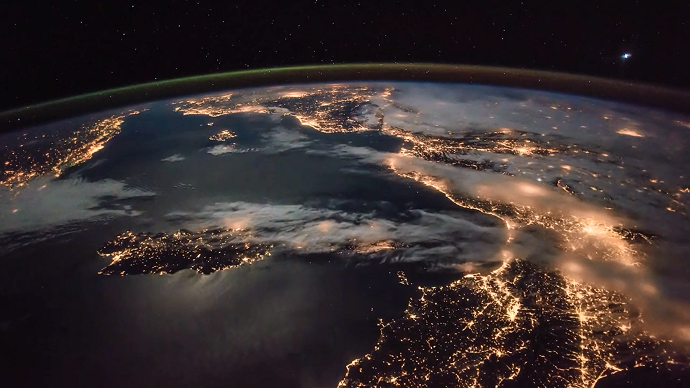 A recently released time-lapse clip filmed from the International Space Station (ISS) shows European and North African cities lighting up the sky, in contrast to the dark expanses of the Mediterranean Sea at night. ISS Expedition 43 captured the footage, as the spacecraft was traveling over the Mediterranean region on March 28. It was then merged into a video and uploaded to YouTube on Thursday. The breathtaking views of European cityscapes from the Strait of Gibraltar to the Balkans are revealed from two different angles, with the northern coast of Africa also partly visible. As the spacecraft hovers east, more densely populated areas light up the sky. The night illumination also clearly shows the stark contrast between brightly lit coasts and the vast scarcely dotted darkness of the Sahara Desert.